To say I had fun creating Keira's nursery is an understatement. I'm not sure if it was because I got to decorate for a girl, or if it was because I was just really ready for a change from the nursery of the boys (aka brown everything!) or if it was because I've grown to better understand myself and trust the visions I set forth to create even if it isn't picture perfect. 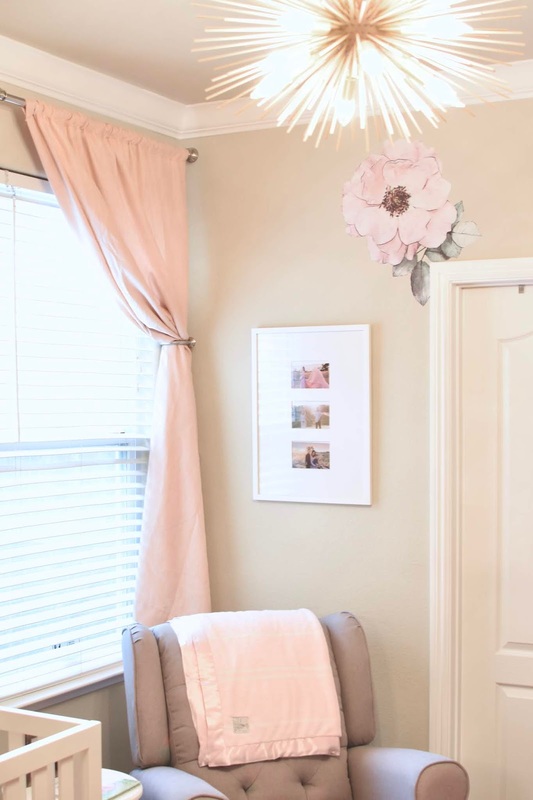 Keira's nursery was a struggle at first because I wanted to go in so many different directions but one thing was constant, I wanted it lighter and brighter. That meant white. I wanted to change out the brown dresser and brown crib and brown rocker. Brown, brown, brown! Ugh. When I first came across the crib from the Soho collection for Forever Eclectic by Child Craft I knew I had the key pieces, the furniture. I love that they are white but have a natural wood foot. Something that is minimal but, oh so different than every other set out there. Plus, they are REAL wood. That means a lot to me for durability and longevity. They have a definite modern/mid century style which I really was drawn too and the clean metal hardware is sleek. The dresser has super large draws all on metal tracks and the chest is the perfect size for the otherwise awkward nook that I never was able to really use before. The best part was that the dresser and chest came fully assembled!! The only thing I needed to do was unscrew all the hardware and re-screw them back on facing outward. 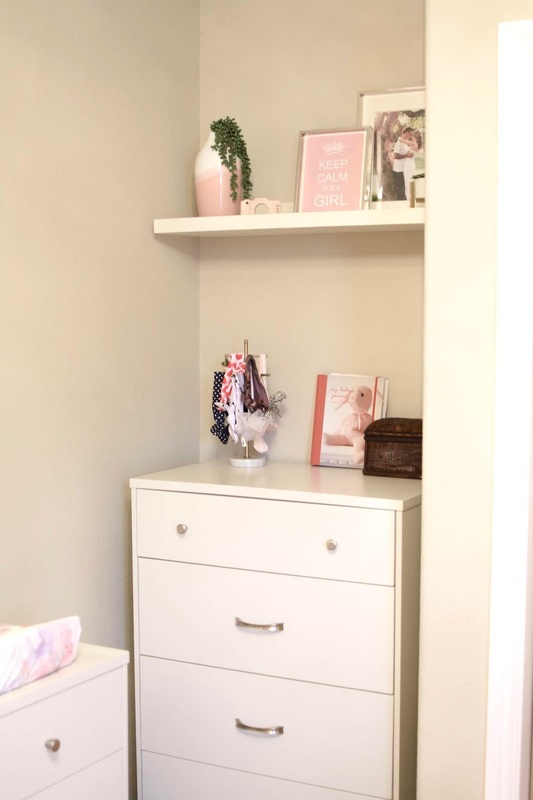 I knew when I started crafting this room that I wanted something feminine and bright. 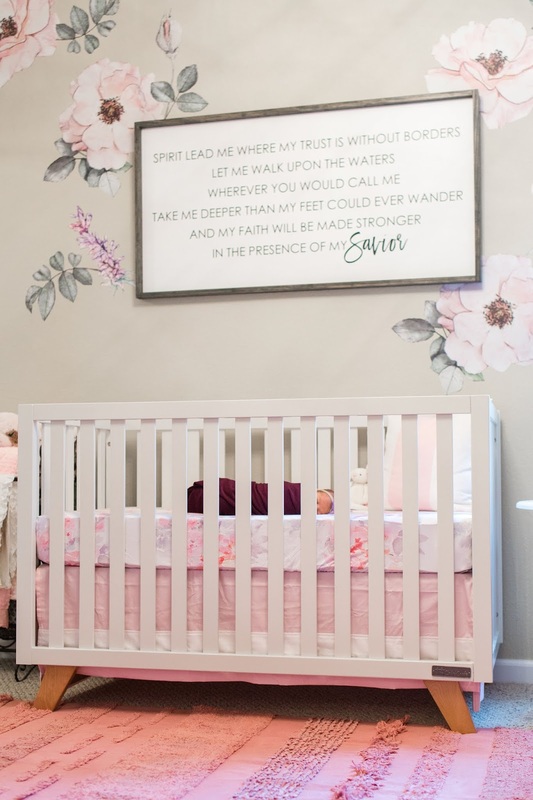 We knew this was going to be our last baby so I didn't need to make the nursery neutral as she is our one and only girl. I contemplated a full wall of wallpaper but when I found these oversized peonies I was just in love. The fact that I can make the design one of a kind. 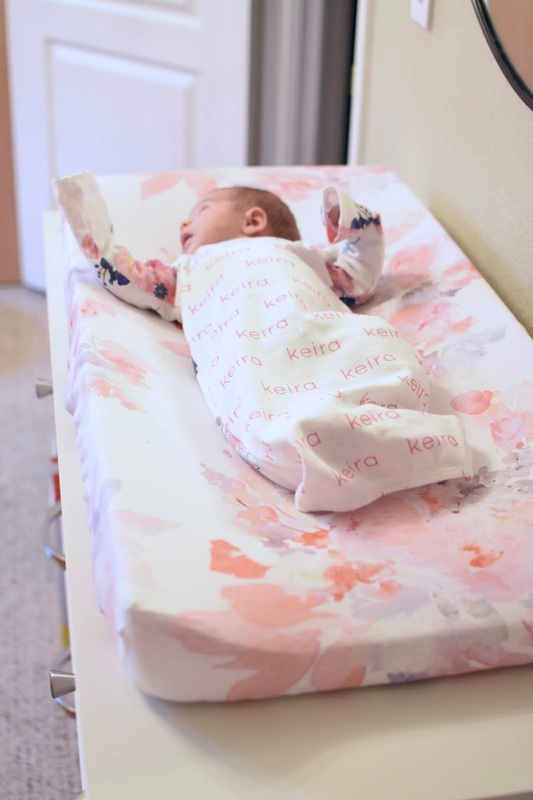 While Keira still hasn't spent a night in her crib it looks beyond cute with the Olie floral sheet and coordinating skirt. 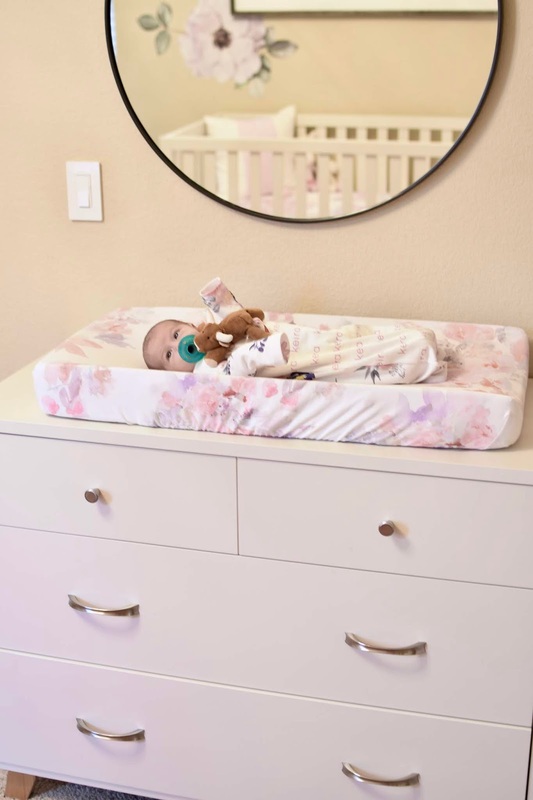 I was drawn to the soft floral pattern that complimented the floral wall decals and brought the same pattern across the room with her changing pad. 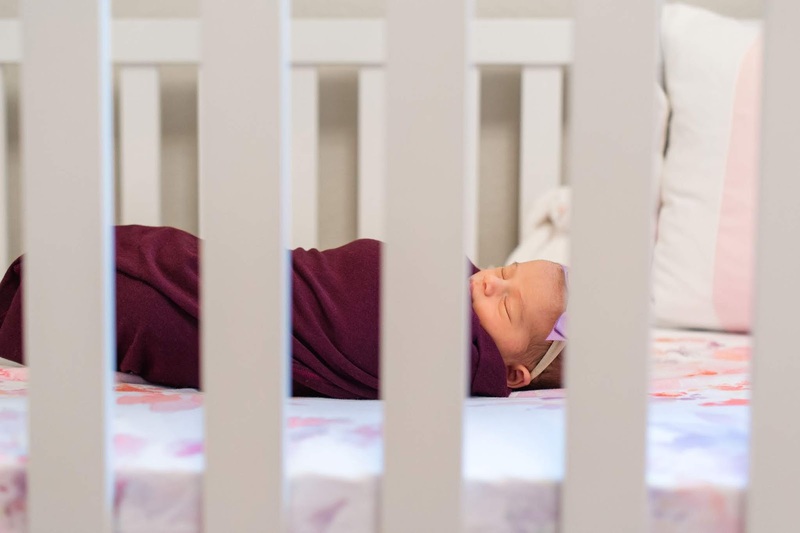 I love that the crib skirt and pillow are also coordinating but not matching. Lends itself to easily mixing up a new pattern or accent easily. Her floor rug is fabulous in so many ways. I love the various textures and dimension it gives but the best part is it's completely machine washable!! This is the second rug of its kind we've had from Lorena Canal and I can't say enough good things. They hold up great and you don't have to worry about them getting dirty because of kids. I threw a fun accent rug over top for added texture and whimsy. It's a super cheap, a fun addition to the room and isn't too bad on the toes either. This is by far my favorite room in the house and it gets the best afternoon light! We spend a lot of time in here while she is awake and the boys love showing her all her toys. What is your favorite room in your house? Next up I think I'm going to tackle updating our room.